it's my turn to be a part of celebrate the boy month! i'm excited to show a little of what i've been working on for that. this year i decided to finally start tackling my boys' room. i knew i didn't want too much in their room for decoration, i believe a boy's room should be a little more on the plain side, but i wanted their room to represent them. and if there's anything that represents my boys, it's clone troopers. but because i'm their mother and i like comical things i also bought this poster to go in their room as well. and because my husband has the same sense of humor i do, i constantly have to hear him say "that poster would sure look great in my office." i think i may get him one for father's day, or i may just have to come up with some other art for that wall and finally quiet him down by giving it to him. a woman can only take so much you know? i like the roll because a) it's cheaper and b) i can make it as long as i want. 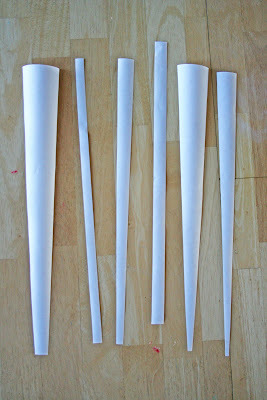 first to create my "light saber fight" pillow (that's what i call it) i cut long pieces of freezer paper. some straight and some a little skiwhompis. 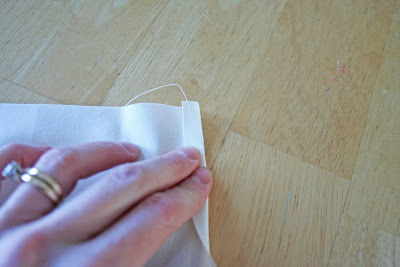 i then placed them on my muslin and with shiny side down and ironed them on. i got my spray paint and did a first layer of paint. 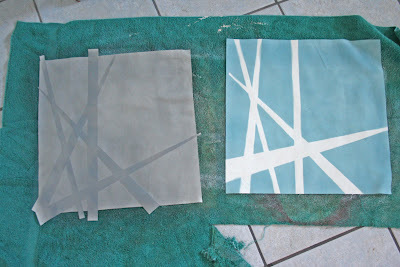 let it dry and repeated the process. 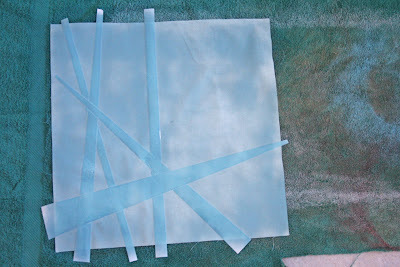 once your paint has had a little bit of time to dry go ahead and peel the freezer paper off. 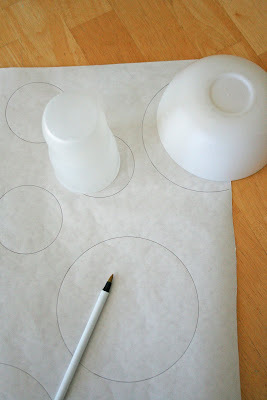 now to make my circle pillow shown, i used a cup for the smaller circles and a bowl for the bigger circle. 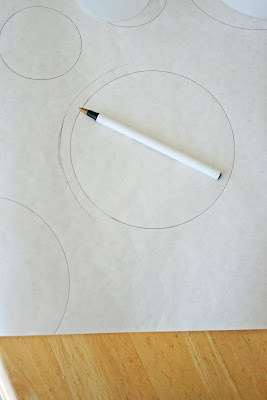 then i free handed around each circle. and i cut out my circles. 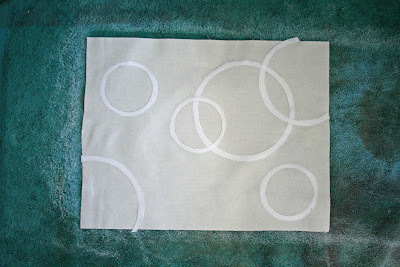 and once you've ironed on the circles. repeat the spray painting instructions. *note for the circle pillow i just made it into a pillow and not a slip cover. so to make this pillow just cut out two of the same size rectangles and when finished spray painting, sew right sides together leaving an opening big enough to turn right side out, stuff and hand sew closed. 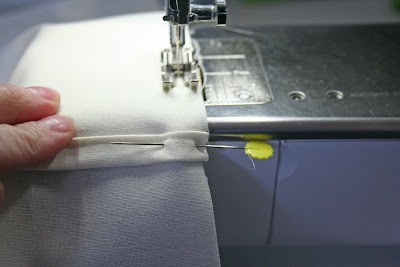 now to make your back of the slip cover. 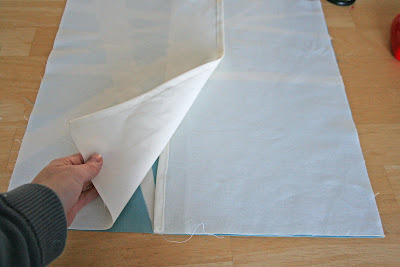 cut two pieces of muslin at 10 1/2 by 16 inches. fold over about 1/4 inch in (on the 16 inch side). you can iron it down but i just "creased" it with my fingers. 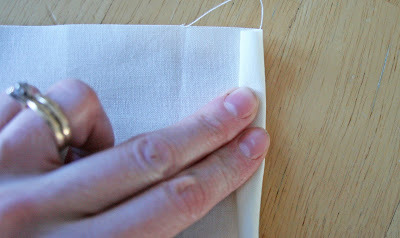 sew down your double fold. next place the other back piece over lapping the first. 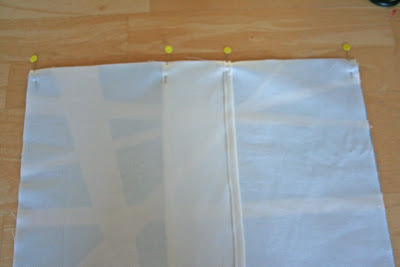 sew all four sides using a 1/4 inch seam allowance. and place them in their room. i'm just at the tip of the iceberg with their room. but i feel like i'm moving the right direction. come back tomorrow, we're changing gears and talking WEDDINGS! 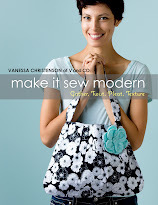 v and co loves her sponsors check out what's new at burgundy buttons! WOW!! love this post! 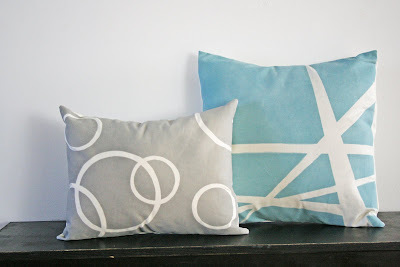 thanks for the super tutorials on how you did those fantastic cushions. Looking forward to Weddings! Those pillows are so cute! Who knew how easy it could be? Rawk. Vanessa- I am so excited you posted this process again as I am planning a stake Relief Society craft day and we will be doing this project. 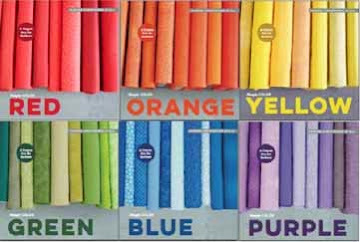 in any case, I am a little confused about freezer paper. Is it the same things as wax paper? 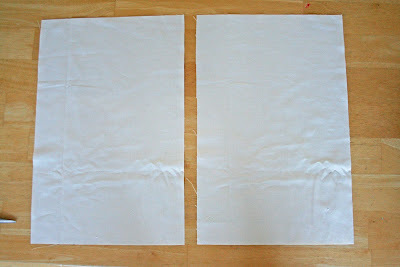 or parchment paper? 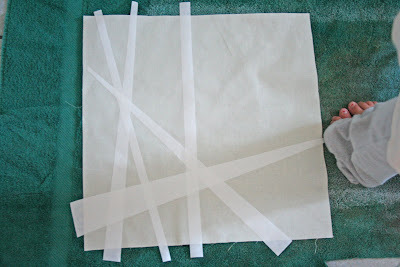 I am starting to feel a little nervous about it because I can't find any thing called freezer paper here in Italy and our activity is just a month away. 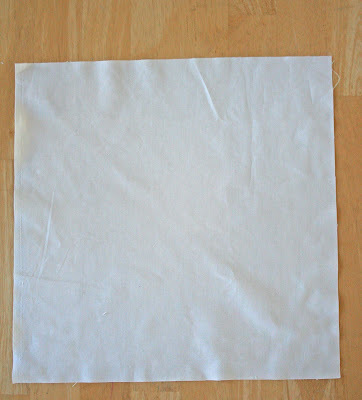 Anyway, if you could define freezer paper for me, I'd be very grateful! Thanks a bunch! yes you can find it in the section where the tin foil is. also sometimes people will have it in the crafting section as well. I love how graphic and modern your designs are. So refreshing! and yes they are washable...they fade over time but they also get softer after the wash.
but i don't suggest you drying them in the dryer as i don't know what they would do to your dryer! Love the vader poster. LOL, can see why your hubby would want that in his office. Your tutorial is really interesting...in a good way. 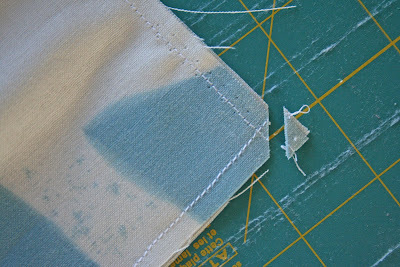 I have never used freezer paper and paint on fabric before. I like the mixing of mediums. Looking forward to the wedding tutorials. Sounds like fun. shane wants that freaking poster. oh and you're my hero. Thank you for the inspiration! I am trying to get my sons room done for his 1st birthday and was looking for some great ideas! I am thinking of using your spray paint design on a bean bag chair! 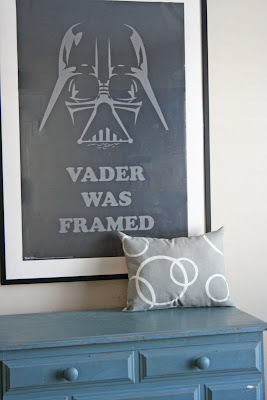 V, I HAVE TO BUY THAT VADER POSTER! My son would love it. 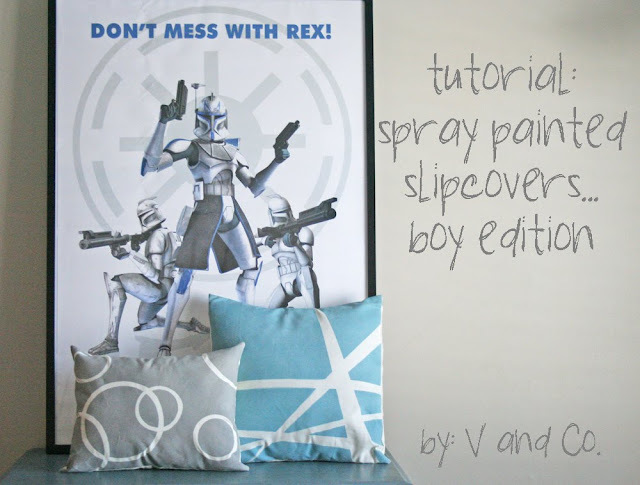 Leave it to you to come up with a fabulous tutorial for boy month! So cool. Thank you for this lovely tutorial! I have two boys and it seems that so many cute crafts and decorations are for girls that it is such a nice change of pace to see something I love (even a bit modern!) for boys! Love the direction of the room & cannot wait to see the final product, hope you post pics! 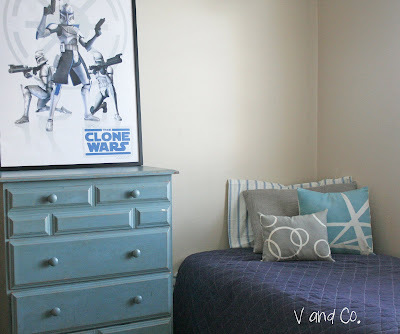 My son would FLIP for a Star Wars room! We are getting ready to seperate his bunks (he's only 6, but tall & he's almost out of room) & changing things up a bit. Great Ideas, and so cheap. I never would have thought to use spray paint. You are so cleaver. LOVE IT! I think I am going to do some new pillows for the boys. Freezer paper and I have just become really good friends. I just did a stinking cute boy shirt, and I am pretty sure I have a bazillion more planned in my head. Love the poster and the pillows! Perfect for a boys room. I loved reading about your thrift store conversation with your husband. Sounds about like mine. These are so cool, what a great idea! Thanks for sharing, I'll be linking. Oh my! My son was SO excited when he saw what I was looking at. Jack has become obsessed and thinks that this is the coolest idea EVER....he wants to move into your boys' room. Fabulous way to bring something crafty and stylish into a boys' room (which--I know, shocker!--are not notorious for being either crafty or stylish). 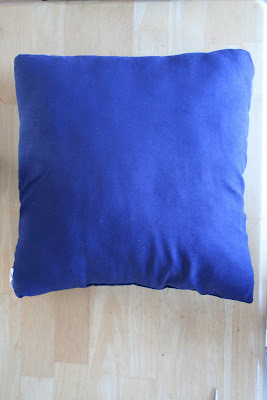 I sew for a decorator and I can confirm we make pillow covers 1" around smaller than the pillow itself. i.e. a 16" x 16" pillow get a 15" x 15" finished cover. And be sure to round the corners a bit on 'em so you don't get 'dog ears." I love the spray paint aspect! How do they hold up to washing? this is so so cute! thanks for the great tutorial!! My niece has something like that. I know I've told you before, but I LOVE your pillows... EVERY ONE! You are so dang creative... LOVE IT! love it! yay for boys!! That is so seriously cool! Really cool! I wondered how that would feel but you already answered that! My mom makes custom pillows all the time (she has a drapery workroom) and she cuts her pillows TWO inches smaller than her pillow form. But ONLY for the nice down-filled pillow forms... the regular cotton-poly-filled pillow forms you would get at JoAnn's and stuff would look silly. In that case, she'd do what you said and cut it the same size as the pillow form. 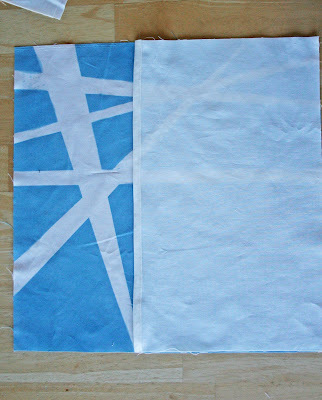 The freezer paper designs you used are fantastic! Maybe if I had a boy I could channel good boy ideas better! Another great tutorial. Love that idea. Love the end result. Looks like a fun room. That "Rex" Poster is so coool! My son would love it!!! I love the looks of the boys room. You did a great job. My boys keep asking me for a "Mar-Wars" room...that's Mario and Star Wars combined. These are so cute. Your creativity never ceases to amaze me. great idea! I totally need some freezer paper. It's almost as useful as coffee filters! Once again, you pull out the awesome! Gorgeous cushions. GOR-geous. Thanks for the tutorial. I love the effect and agree - that poster is too fun! This is super creative! Thanks for sharing! I LOVE THESE! I can't wait to make them. I had to share, so others may be inspired too!